has broadcast is about the equivalent of some 36 ½ NHL seasons. The full story is on the Detroit Red Wings' website. They are on a roll too having won five of their last six games while our province's team, the Vancouver Canucks, have lost three of four - including to Detroit in overtime on Saturday, 4-3. Today is March 14th so I want to point out some great 14's. 14 gold medals for Canada at the Winter Olympics! NO nation has ever done better than that standard. Close - but no cigar, winning 13 gold in 2002 was Norway while the Soviet Union did that as well in 1976. 12 gold medals were won a couple of times by Germany - once in 2002 and four years earlier in 1998. My son Jordan is 14 - but in 15 days he turns 15. We enjoyed the BCHL playoff game last night between the Westside Warriors and Penticton Vees. Westside won a thriller in overtime, 4-3, to tie the playoff series at 2 games each. Number 14 for the Warriors is Kyle Singleton while Penticton's #14 is Alex Szczechura. He scored a goal Saturday night and was born in Wayne Gretzky's hometown of Brantford, Ontario. Szczechura has committed to playing Division One hockey next season at Ohio State. Alex Burrows got his 31st goal against Ottawa. He was born in Quebec, just like Philadelphia's #14, Ian Laperriere. But most of the #14's in the NHL were born in Canada. Kelowna, BC is hosting the Detroit Red Wings' practices next Wednesday and Thursday. Detroit is taking a three day break in our city between games against Calgary and Edmonton. Admission to each of the 11 AM practices at Prospera Place is by a donation to the Kelowna Community Food Bank. Detroit hosts Buffalo and Olympic tournament MVP, Ryan Miller, tomorrow night. His brother Drew is on the Red Wings while another Olympic all-star, Brian Rafalski, is on Detroit's defense. The Sabres' Ryan Miller had a mammoth Monday media day! Check out his busy itinerary here. He was born not too far from Detroit in East Lansing, Michigan. Ryan Kesler was another US standout at the Olympics who plays for the Vancouver Canucks. They host Detroit on Saturday, March 20th. He was also born in Michigan - very close to Detroit in Livonia, a city about the same size as Kelowna. Kesler scored in the men's hockey final and has now scored the coveted cover for the NHL 2K11 video game, following in the footsteps of Alexander Ovechkin, Rick Nash, Jason Spezza and Joe Thornton among others. Kesler calls it the "icing on the cake" after his Olympic experience. "Everything just keeps getting better for me," he told The Canadian Press. "I'm very excited." and the annual NHL New Year's Day "Winter Classics." Philadelphia and Boston played this year at fabulous Fenway Park. Buffalo hosts Philly tonight in the NHL but on January 1, 2008 the Sabres hosted the other Pennsylvania team (Pittsburgh) in a "Winter Classic." a portion of the proceeds from it's sale going to the Buffalo Sabres Foundation. A 2 1/2 minute clip with narration from yours truly is below. St. Patrick's Day: Ronan Tynan (who is featured on "The Making of a Classic" DVD) along with special guest Méav. Click here for all the details. 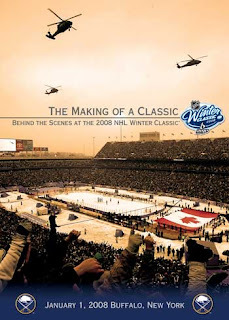 If you would like a copy of "The Making of a Classic" DVD, email me at drhass@shaw.ca and I will pass your information along so you can make a contribution to the Buffalo Sabres Foundation.